Are you a party-planning efficiency whiz? Or do you burn the midnight oil making everything all yourself? We split the difference on Sunday in Long Beach and made some unique ornaments to remember while enjoying Cider Manhattans. Here are our tips for three DIY ornaments, all made with clear round glass balls, that you can personalize to create an everlasting memory. The key ingredients to a successful paper decoupage are unique paper and something memorable. We used decorative paper trimmings from Blick, which you can get for $3 a pop, and an old French paperback novel. Many of the designs on the decorative papers are translucent, which creates a cool effect on a glass sphere. Try checking out your local thrift or scrap stores. To make the ornament, it is important to cut the paper into small enough pieces so that it conforms to the sphere. Unless you’re going for texture! To attach, mod podge the glass ornament, attach the paper, then add another layer of mod podge with your sponge brush on top of the paper. I like overlapping different paper, or cutting out a design from the old book pages and putting that on top. We had beautiful traditional-looking gold and burgundy designs, an American flag, and a cocktails+craft ornament complete with pencil shavings and a book! Around the holidays, your local fabric store will probably have trimmings of holiday-themed fabric available at a reduced price. I grabbed some of those along with a variety of ribbons, and we went to town. The technique for decoupaging with fabric is the same as paper - glue on both sides. The ribbons sometimes needed a little manhandling, but resulted in some beautifully elegant golden ornaments. 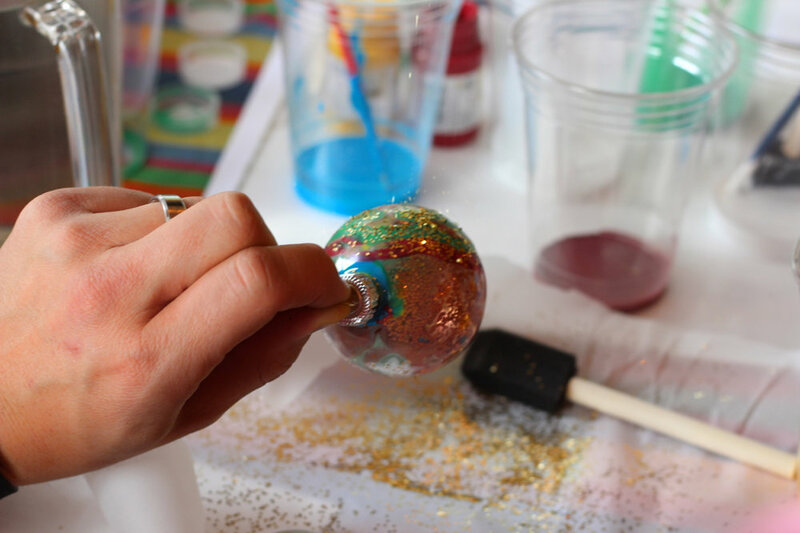 With some basic craft paint, mod podge, glitter, and water you can fill a clear glass ornament with anything you like! This is somewhat freeform. It helps to water down the paint before dripping it into the ornament, then you can tilt or shake to create different designs. Yes, there was glitter everywhere. As always happens with cocktails+craft, more than one person said “tell me how to do it, I’m not creative.” Not so! Everyone came up with incredibly unique designs that told their own holiday story. See you at our next cocktails+craft on the West Coast in January! Details coming soon!